Kindness advocate, adventurer, bestselling author and TV personality Leon Logothetis, a former London broker who traveled around the world on his yellow motorbike, relying solely on the kindness of complete strangers for food, gas for his bike and a place to sleep, will speak at IUPUI Wed., Sept. 23. The event is free and open to the public. 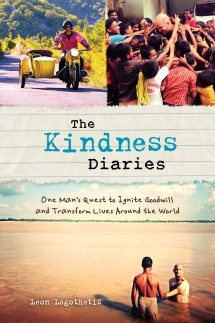 Logothetis’s journey is detailed in his bestselling book, The Kindness Diaries: One Man’s Quest to Ignite Goodwill and Transform Lives Around the World. He is now crossing America on the “Giving Back” tour, speaking about the power of kindness and human connection. At IUPUI, Logothetis’ remarks, “I See You…The Power of Human Connection,” will focus on his experiences connecting with people around the globe and his mission to create a kinder world. The event and a book signing will be held Sept. 23, 4:00 to 6:00 p.m. in the Riley Auditorium, 705 Riley Hospital Dr., Indianapolis. On Sept. 24, Logothetis will host a competition during which an IU Lilly Family School of Philanthropy student will win a $7,500 scholarship to serve abroad through UBELONG, an international volunteer agency, including $2,500 to give away to an organization they encounter during their travels. Each student will present a five-minute, five-slide presentation on “What Places and Causes are Meaningful to You?” The scholarship is offered in conjunction with the Human Interaction Project (HIP), which Logothetis founded. The public event is hosted by the IU Lilly Family School of Philanthropy and co-sponsored by the IUPUI Office of Community Engagement, the Center for Service & Learning and the Division of Student Affairs. The Lilly Family School of Philanthropy has been teaching and learning actively about philanthropy in more than 40 countries around the world since its founding in 1987. Its international partnerships, teaching and research have grown exponentially in recent years. Follow us on Twitter @IUPhilanthropy or “Like” us on Facebook.